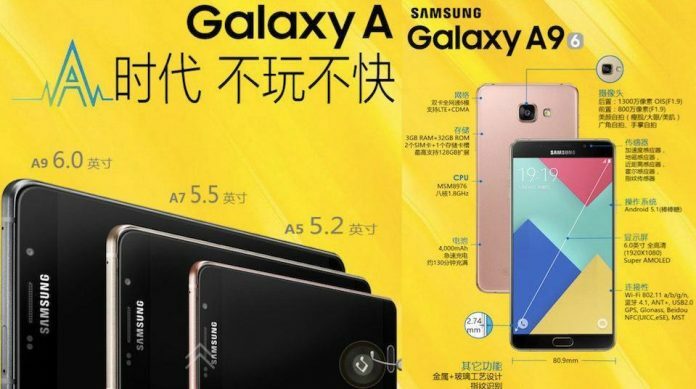 Samsung has added a new phone to their Galaxy A series with the release of Samsung Galaxy A9 which has some really good specifications and design. After the launch of Galaxy A3, A5, A7 and A8, this is the fifth phone in the Galaxy A series. As the number goes up, the specifications of the phone also increases, that wise A9 is the most high-end phone of Galaxy A series till now. It will support dual nano SIM with 3G and 4G support in the international variant. As per the report, A9 will be available in 3 colors, i.e. Pearl White, Midnight Black and Champagne Gold. It will come with Android 5.1.1 Lollipop with TouchWiz out of the box and is expected to get a Marshmallow update soon. Galaxy A9 is build with glass and metal and is very similar to that of A5(2016) and A7(2016). It also features the newly integrated Samsung Pay feature that can only be found in high-end Samsung devices. Samsung Galaxy A9 features a 6.0 inches super AMOLED screen with a full HD (1080 x 1920 pixels) resolution. As always the super AMOLED screen is very bright and crisp, the users will definitely enjoy the videos and movies in such a large screen. The phone is mere 7.4 mm thick, which makes it a slim device, though it weighs around 200 grams, it is still a comfortable device to hold on. The phone runs on Snapdragon 652 octa-core processor with 3 GB of RAM and 32 GB of internal storage. The graphics are handled by Adreno 510 GPU. The internal storage of the phone can be expanded up to 128 GB via micro SD card. Galaxy A9 features a 13 MP primary camera with optical image stabilization and auto-focus features, on the other hand it has a 8 MP front facing camera that can capture full HD videos. Galaxy A9 also features a Fingerprint in its home button similar to other high end Galaxy S series devices. The main attraction of A9 is its battery, which is 4000 mAh and does support fast charging. No wonder that you can expect at least one and half day of battery backup with above than average usage. Other features include EM radio with RDS, Wi-Fi, Wi-Fi Direct, Hotspot, Bluetooth 4.1, GPS, NFC and a 3.5 mm audio jack. According to SamMobile, the device is expected to release soon and the pricing of A9 will also be disclosed in coming weeks by the officials. The device will first be available in China in a Galaxy A Party 2016 event and then will be released in other countries. The phone is expected to be priced around $499. We will soon be updating the article with more information about Samsung Galaxy A9, especially about its availability and pricing, so stay tuned with us. You can download the default wallpaper from Galaxy A9 from here. Samsung Galaxy A9 is a premium looking device with some better than average hardware specifications like 3 GB RAM, full HD display and 4000 mAh battery. A good phone to look for, if you need a 6 inch screen smartphone.